We are proud to be resident at St. George’s Church, Beckenham which has a long, strong and respected musical heritage, and boasts one of the finest church choirs in the UK. 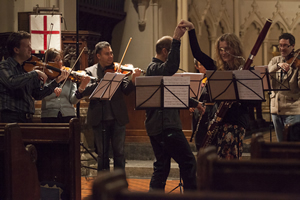 With its spaciousness, good acoustics and warm friendly atmosphere the church is an ideal venue for a chamber orchestra. The orchestra would like to express its thanks to everyone at St. George’s, and in particular to the Rector and the Parochial Church Council for their valued and continuing support.